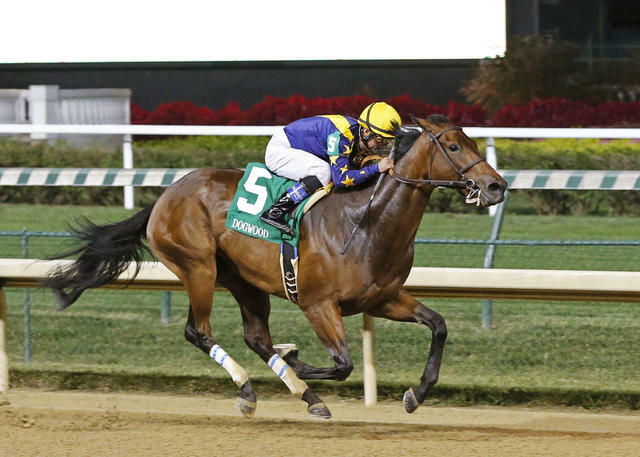 Southern California invader Super Majesty led nearly every step of the way in Saturday night’s 40th running of the $100,000 Dogwood Stakes (Grade III) at Churchill Downs to beat Chide by 1 ¾ lengths and give owners Larry, Nanci and Jamie Roth of LNJ Foxwoods their first graded stakes win. 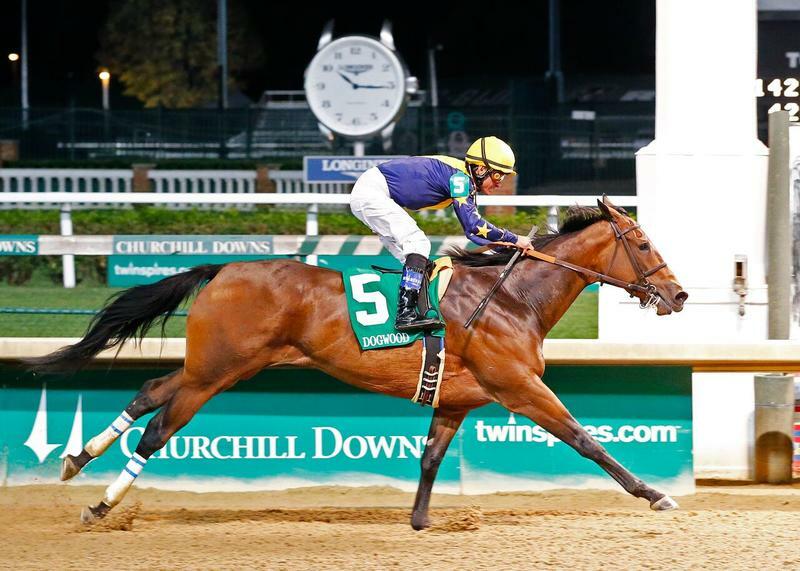 Super Majesty, the 6-5 favorite in a field of 12 3-year-old fillies, grabbed the lead after a quarter mile in :22.78, clicked off a half-mile in :45.58 and finished strong down the stretch to run seven furlongs over a fast track in a stakes record 1:23.02 for the Hall of Fame duo of trainer Jerry Hollendorfer and jockey Alex Solis. Pleasant Tales and Florida-based Husaca attempted to pressure Super Majesty early but the bay filly kicked clear for a length advantage down the backstretch and drew away under right-handed urging from Solis down the stretch. A $3,000 supplemental entry to the Dogwood, Super Majesty returned $4.20, $3 and $2.60 to her backers. Chide, the 5.90-1 third betting choice, rallied from behind under Shaun Bridgmohan to get second and paid $4.80 and $3.40. Sweet Swinging, ridden by Channing Hill, got up for third and returned $9.40. Kathballu, Huasca, Street Song, Heart’s Song, I’m a Looker, All Day Alice, Zeven, Sweet Success and Pleasant Tales completed the order of finish. The victory was worth $57,660 for the Roths and boosted Super Majesty’s earnings to $133,860. Super Majesty, a daughter of 2010 Kentucky Derby champ Super Saver that was purchased for $400,000 at the 2014 Fasig-Tipton Florida Sale under the advice of Solis’ son and blockstock agent Alex Solis II as well as Jason Litt, has won three of her four starts and has been favored every time. She suffered her lone defeat Aug. 23 as the heavy 1-5 favorite on Aug. 23 when she was edged by a nose in a two-turn, one-mile affair at Del Mar. Prior to that, Super Majesty won by 15 ¼ lengths in a first-level allowance/optional claiming race at Los Alamitos in July. Bred in Kentucky by WinStar Farm LLC, Super Majesty is out of the 1994 Kentucky Derby winner Go for Gin mare Gins Majesty. The Dogwood was the feature race on an 11-race “Downs After Dark Presented by Stella Artois Jack Daniel’s” nighttime racing program that attracted 14,786 fans. ALEX SOLIS, jockey of SUPER MAJESTY (winner): “I talked to (trainer) Jerry (Hollendorfer) this morning and we didn’t think anybody had the speed that she has. They didn’t. “I still think she can route. She’s lightly-raced and still maturing. Also, the way she moves gives me the idea that she can route, too.